THIS is the recipe I use - with some modifications which I have detailed below. I’ve also included some helpful tips. Heat oven to 350°F (325°F for dark or nonstick pan). Grease and flour or spray bottom and sides of 13×9-inch pan. Bake 29 to 35 minutes (mine is done at about 30 mins) or until edges are golden brown and toothpick inserted in center comes out clean. Let stand 5 minutes. Poke top of hot cake (I wait until it is warm - if it is too hot, the cake comes out with the fork or knife and makes a mess) every 1/2 inch with long-tined fork, wiping fork occasionally to reduce sticking. In large bowl, stir together sweetened condensed milk, whole milk and whipping cream. Carefully pour evenly over top of cake. I then also pour 2 tablespoons of coconut rum over the cake. Cover; refrigerate about 1 hour or until mixture is absorbed into cake (I refrigerate overnight). Frost with frosting. (I use homemade whipped cream). Wait until the cake is warm to poke the holes. I use a knife - not a fork. Less mess. Use the rum. You won’t really taste it, but it makes a difference. Trust me! Don’t freak out when pouring the milks onto the cake. Do it slowly as to not overflow your pan. It will all absorb. Refrigerate your cake overnight so the milks have a chance to absorb into your cake. Take it out an frost with homemade whipped cream RIGHT before you serve it. Make the whipped cream!!! Frosting will be too sweet and this cake is far too good for Cool Whip! If you want, sprinkle the whipped cream with toasted coconut when frosting. I like it both ways, but my husband thinks the toasted coconut is a nice touch! Put a piece of cake aside for yourself for later when cutting it, because once word gets out, this cake goes fast! Tres Leches Cake has been posted in Crafty Mamamamahoney and Tagged: 3 milks cake, betty crocker, cake mix, cake mix cakes, cake recipes, easy cake recipes, recipes, tres leches cake. Just call me Susie Homemaker! With all of the peppers that we having coming off of our 6 banana bell and 2 paprika plants, I hit the internet looking for something to do with them. First, I thought about pickling them, but honestly, I’m not really sure what you do with pickled peppers. I stumbled across some recipes for pepper jelly, but most of them included hot peppers. I took a stab at a recipe today, using all paprika and bell peppers, rather than including a hot variety. I followed the recipe to a T and unfortunately, I think the size of the jars were labelled incorrectly in the recipe considering it said you should get 6 and I only got 2 3/4. So, I will showcase the steps here and in a few days, if the jelly actually tastes good, I’ll post the recipe with the noted change in jar size. This is all you need to make Pepper Jelly - easy & simple - just the way I like my recipes. 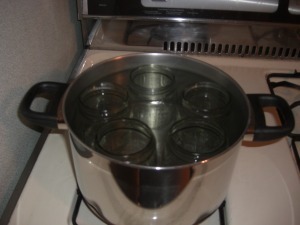 First, you need to sterilize the jars before you make your jam/jelly. Next, I chopped the peppers. I used a mix of yellow and blush banana bell peppers and red and almost red paprika peppers. 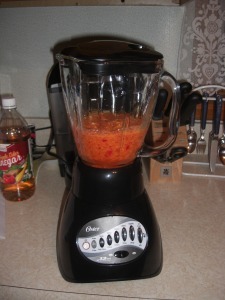 I blended the vinegar and chopped peppers until there were only small bits of peppers left. 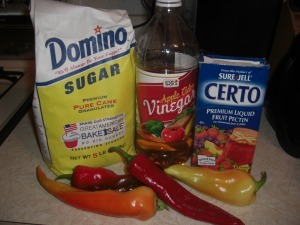 Next, I boiled this mixture with the rest of the vinegar and added the sugar and certo. Finally, I ladled the mixture into the jars and processed it in a hot water bath to seal the lids. The 3/4 jar will be used as our tester jar to see how this recipe tastes. It looks beautiful in the jars and I have high hopes for it. However, last year we made a mustard recipe from the internet that had over 200 4 and 5 star ratings and it was complete crap and we wound up throwing it all out. So…..I’m keeping my fingers crossed for this one. If this works out, I can probably make this recipe another 25 times and still have peppers left over. Seriously. 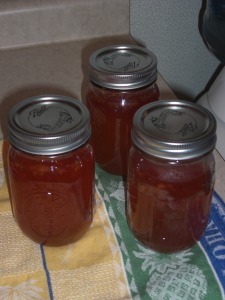 Banana Pepper Jelly has been posted in Crafty Mamamamahoney, Gardening Mamamamahoney and Tagged: banana bell pepper jelly, banana bell peppers, canning, canning vegetables, internet recipes, jelly recipes, paprika peppers, pepper jelly, recipes.